The Tile Roofing Institute enlisted the University of Southern California to perform an independent study on the safety of concrete and clay roof tile in the event of a major earthquake. 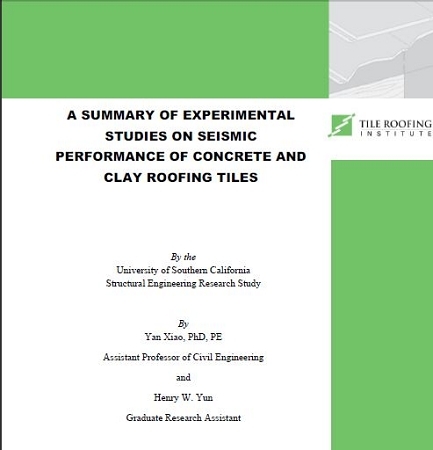 This study has shown that concrete and clay tile roofing systems, when installed according to building code standards, exceed current seismic load requirements for building materials. A summary of this study is available for purchase as a PDF Download. Copyright TRI Store. All Rights Reserved. eCommerce Software by 3dcart.